I've been using a camera since my teens. An introduction to black and white developing printing accompanied a university course, and I've become more serious as the years have passed. I now run a commercial photography business, working mainly in architecture and the heritage sector. 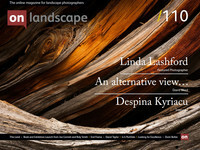 Landscape is a personal project for me. Joe is a Secondary School Art teacher living and working in Cornwall, his home county. He uses both film and digital cameras to capture the less obvious aspects of his local environment. Recently he has been interested in presenting work as hand made books, and offers landscape photography workshops to individuals and small groups. The rich variety of local coastal areas and their unusual geology have provided him with the most inspiration for his work. I have photographed the River Tweed very many times since we came to live by it fifteen years ago. It’s a river that very much dominates the landscape as it runs nearly 100 miles from its source above Tweedsmuir all the way to Berwick. I know the river well. I have walked its banks on many occasions and kayaked the stretches near us over several years. So it’s an integral part of our life in Peebles, making its mark wherever it goes. And as it flooded dramatically again in mid-January, it certainly made its mark for some unfortunate people. In these four pictures I think I have captured at last what the Tweed means to me. It sense of calm, quiet strength (something I have experienced directly from within the kayak). Its beauty as it runs through some narrow, rocky gaps. And everywhere the trees that lean over it. They were all taken on the same visit; a cold January day just after the first snows had fallen. And they were all taken on the Nikon D800 with a Nikkor 24mm PCE lens. Some with a Lee Big Stopper. All on a tripod. For those interested, they were initially processed in Lightroom CC, then converted in Silver Efex Pro, then back to Lightroom for final tweaks. Having spent many hours taking photographs of the Cornish coastline over the last decade, I gradually found my appetite for the wider landscape was waning. I started to notice the smaller details in the landscape, particularly the different rock formations we have in Cornwall. This went hand in hand with a pretty limited time frame to shoot in, and so making use of available (and very often flat) light was a necessity. The subtle colours and details began to reveal themselves under the grey and the rain, and I found I entered a different state of mind when shooting them. It became more of a game, finding things, places, that others would walk past, simply not notice. The combination of the trans-formative power of photography, and the mental state needed to 'see' the compositions really took hold. A basic fascination for the local geology was also a great draw. We are blessed with so many varieties of rock in a very small area, some quite special on a global scale. The nature of abstract photographs places more emphasis on composition, texture and shape, all the basics of Art in general. I really like this aspect of these detailed intimate shots, finding relationships with painting, which is what I teach and trained in. The shots themselves are all of slate, taken on just two Cornish beaches. Gunwalloe is just 2 miles from Poldhu on the South coast. The way slate fractures, discolours and catches the light in geometric shapes continues to attract me to it. I will often use a tilt lens to get focal planes looking down or up cliff and rock faces. I like to deliberately leave the scale ambiguous, which I think creates an image with longer lasting appeal. Many of these shots are very hard to repeat or even find! The four images were all taken on a workshop in North Wales with Richard Childs (See Richard's articles) exploring the abandoned slate mine workings and all taken on film with a Hasselblad 500cm. The mines are slowly being taken back by nature which is why it was such a perfect location for me and I think. Using black and white seems to fit the gritty industrial nature of the locations, can't wait to go back. "All the images that we’ve made for “On Your Doorstep” exhibitions were taken from a car park, from a side of a road, or not more than a five minute walk." I am spellbound by nature. Walking amongst the trees, I’m filled with peace and a sense of one with Earth. Watching marram grasses blowing in the breeze brings me joy and wonder. When these areas are destroyed in the name of progress, my heart hurts. We know that destroying nature isn’t good for humanity and, with all the negative messages we get, it’s hard not to see the situation as hopeless. Don’t we all prefer to be part of a story with a happy ending? That is the philosophy I bring to my On Your Doorstep project. I highlight what is beautiful and shine a light on the wonderful work being done around the world to protect and restore our planet. The project started in 2014 with a focus on highlighting the beauty on people’s doorsteps. In the UK, I make images to show people what’s often only two, three, four miles away from their homes. If I can get them to appreciate what’s local to them, there’s a greater chance they’ll protect it.